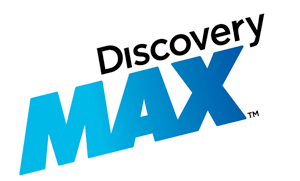 Discovery Networks International is launching the new free-to-air channel ‘Discovery MAX’ in Spain on January 12th, with a logo and identity system created by Form. 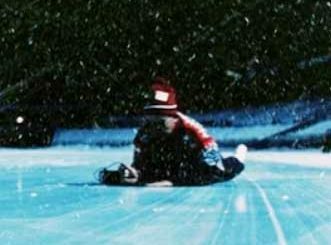 Targeted at a broad audience, the channel will offer a variety of programming including wildlife, motor, cooking, docurealities and extreme survival. Art direction for the new identity is by Paul West/Paula Benson at Form. 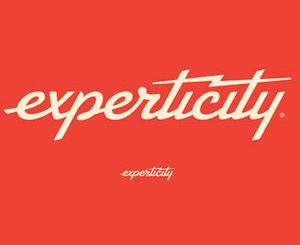 The logo itself incorporates the Discovery corporate typeface for the word ‘Discovery’ in order to have direct connection to the parent brand. 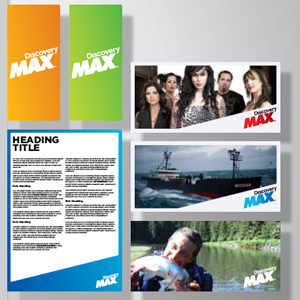 A highly customised version of Futura extra bold was used for the work ‘Max’. “A key identifier of the logo, and indeed the overall visual language, is a dynamic upwards angle running from left to right across all pieces,” explained Benson. “This angle applies to imagery as well as graphic panels. A colour gradient system from light to dark is also a key part of the identity. The lead colourway is a vivid blue fade [reminiscent of a globe/sea/nature] and secondary palettes in red, yellow and green. Form has created all versions of the logo for use across a multitude of materials, a comprehensive identity system and styleguide which covers the design of print and outdoor advertising, event banners, presentation templates, stationery and merchandise. 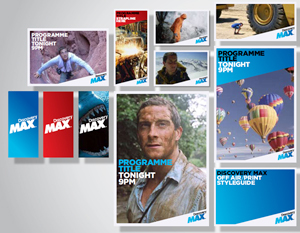 The system was designed to work with the on-air identity developed by Discovery’s creative team in London.